INTERNATIONAL GIVEAWAY! 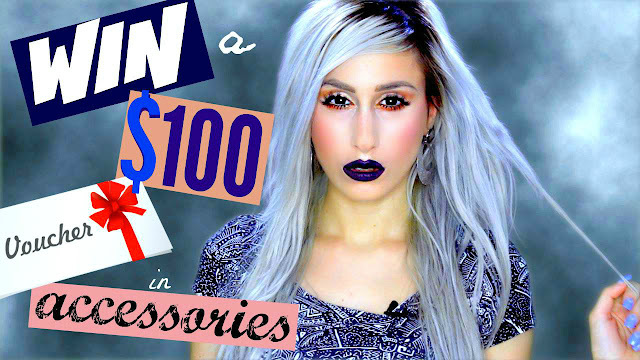 ► WIN $100 in JEWELLERY / ACCESSORIES ! THANK YOU FOR WATCHING YOU BEAUTIFUL THANGG! SOOOO today I have a GIVEAWAY! A lucky subscriber is going to win a $100 voucher in accessories / jewellery from www.airycharm.com . They have kindly sponsored this prize away to me to give to to ONE lucky subscriber ! You can pick anything off their website up to a $100 value and they have free international shipping, which means you WILL NOT pay for shipping. NADA! All because you are awesome! This video is NOT sponsored, so just so we are clear I did not get paid to do this video, I am merely getting a free prize for one of you dolls! WHICH IS AWESOME! SO EXCITED! CAN you tell?? TO ENTER fill in the rafflecopter entry widget thingie up here, and you'd be entered for the raffle of the prize. There is only one mandatory entry : to be SUBSCRIBED to my channel (you would have to type in your youtube username in that entry in the Rafflecopter widget)- the rest are all ways to gain extra entries and increase your chances of winning! I will be announcing the giveaway live in TWO WEEKS : which is FRIDAY 25TH SEPTEMBER. *EXTRA DISCLAIMER* I am not responsible for the prize AiryCharm https://www.airycharm.com will be providing and the website is responsible for providing the prize. THUMBS UP | COMMENT | SHARE - I LOVE to answer your questions and read your comments!
. Fancywitch.com 10% OFF : Use code " DYNAYT "
. IHERB | http://bit.ly/UKrnPE for $10 OFF when you spend $40 ! This is Not a Sponsored video. Products marked with a * were sent for pr purposes but as always I'm a 100% honest. $100 VOUCHER Airycharm.com WINNER ANNOUNCEMENT !